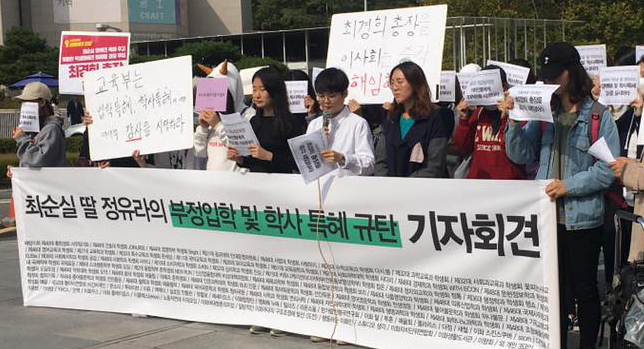 The president of Ewha Womans University came under growing pressure to step down Monday, over allegations the school offered preferential treatment to the daughter of President Park Geun-hye’s close friend. Calls for Choi Kyung-hee to resign come amid mounting controversy that Jeong Yoo-ra, daughter of Park’s long-term friend Choi Soon-sil, was given special favors in the admission process and her academic records at the nation’s longest-running women’s university. Jeong, whose father is President Park’s ex-aide Jeong Yun-hoe, has been accused of entering the prestigious university on the back of her mother’s connections and receiving good grades despite long absences from the school and submission of assignments past deadlines. “Jeong did not attend any classes, excusing herself for participating in a horse-racing competition, but she earned a grade. The school even offered a personal guide for her to complete her seasonal course,” said Choi Eun-hye, president of the student council from Ewha Womans University at a press conference held on campus Monday. “President Choi Kyung-hee should take responsibility for her failed communication, undemocratic operation of the school and involvement in corruption,” she added. An anonymous student, who said they took the same class as Jeong during the last semester, put up a poster on one of the school buildings’ wall on Sunday, calling for an apology from her professor. Some professors claimed they were instructed to select Jeong, who belongs the nation’s dressage team, despite her inadequate qualifications. The school allegedly changed its school policy starting in 2015 to expand admissions for student athletes in wider categories including horse-riding, which students claim targets Jeong. It is also suspected considering the gold medal she earned at the 2014 Asian games past the application deadline. An association of professors from the school vowed to stage a rally Wednesday afternoon to demand Choi step down over the allegations. In her defense, Choi stated that there was no “preferential treatment” for the 19-year-old student. “One thing I can say for sure is that there was no preferential treatment. I will candidly clarify all the suspicions brought up by the media,” she told reporters ahead of the closed-door meeting with Ewha students and faculty members in the afternoon. Opposition lawmaker Rep. Park Jie-won of the People’s Party called Jeong the most powerful person in Korea in the party’s emergency meeting at the parliament. Jeong took a leave of absence from the school last month amid growing allegations. The mounting controversy appears to continue to deal a blow to President Park, who has been embroiled in a series of corruption scandals involving her close confidants since her inauguration in 2013. Jeong‘s mother Choi is suspected to be a political bigwig pulling strings behind the scene. Choi is the daughter of Choi Tae-min, the late pastor who is said to have served as a mentor for President Park. Choi has been thrown into spotlight after opposition lawmakers accused her of being deeply involved in managing the Mir and K-Sports Foundations. The foundations allegedly raised large sums of donations from the nation’s major conglomerates thanks to Choi’s influence-peddling.